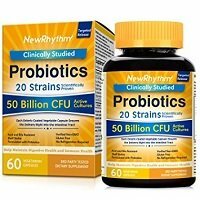 After testing out NewRhythm Probiotics 50 Billion CFU, I give it 1.5 out of 5 stars. It’s definitely on the lower end of the spectrum as far as probiotics go. I have quite a few issues with it and there aren’t many, if any, upsides to it. For starters, it just really goes overboard with probiotic strains and CFU. It has 50 billion CFU and 20 probiotic strains. It even suggests taking up to 4 capsules daily, which would leave you with 100 billion CFU, which is super excessive. Sometimes more isn’t always better and this is true for probiotic supplements. It can lead to negative side effects and even hinder other good bacteria. The website is also very strange and leaves much to be desired. Pretty much all of the links are broken and it doesn’t give you very much, if any, information. It’s vague in a lot of the lingo, for instance, it says it has 50 billion CFU at the time of manufacture and “an effective level until at least the “best by” date”. But what qualifies as “an effective level”? It also has very little info about the satisfaction guarantee and doesn’t disclose what the prebiotic fiber is from, which is very odd. I also just didn’t see any positive effects after taking this probiotic. Luckily, I didn’t have any negative side effects, which is definitely possible with a supplement that’s this strong. I just got a weird feeling about this company and wasn’t impressed at all. Also, just not seeing any benefit after taking this supplement for a while. So all in all, I don’t think this probiotic is a good option if you’re looking for some real help, whether it be for digestive, immune function, or for overall health. As the name suggests, NewRhythm Probiotics 50 Billion CFU contains 50 billion active cultures and has 20 probiotic strains. Both of these numbers are insanely high and rather unnecessary. I don’t like products that use incredibly high strains and CFU because it can actually cause some potential issues. Some strains don’t gel well together and it can cause side effects, as well. This product also uses strains I’ve never seen or heard of before, which is weird. For instance, it has Leuconostoc mesenteroides and B. adolescentis and I’m not familiar with either of these. Usually probiotic supplements stick to the most common and researched strains. But it does have one of my all time favorites, which is Lactobacillus acidophilus. This strain is heavily researched and has been shown to soothe symptoms from Irritable Bowel Syndrome (IBS), Crohn’s disease, and gut dysbiosis. It’s also suggested to help treat yeast infections, boost immune function, and decrease the frequency of urinary tract infections (UTIs). Unfortunately, it also has one strain that I’m not a huge fan of – Lactobacillus casei. L. Casei is an aggressive bacterium that can overrun other “good” bacteria by occupying areas that other probiotics might have taken in the body. This product says it contains an “Organic Prebiotic Fiber Blend”, but it doesn’t specify what the actual prebiotic fiber is from. That’s another red flag and odd to me that they wouldn’t disclose that info. NewRhythm Probiotics 50 Billion CFU seems to be very allergy friendly. On the bottle, it says that it does not contain: gluten, soy, corn, lactose, egg, fish, shellfish, milk, tree nuts, rice, sugar, wheat, yeast, starch, and peanuts. It also says it’s free of fillers, binders, sulfates, sodium, artificial ingredients, colors, flavors, or magnesium stearate. It’s verified non-GMO and the capsules are vegetarian. The other ingredients include: microcrystalline cellulose and vegetable capsule. I’m seeing some discrepancies with price for this product. On their website, if you go to their “Products” page (https://www.newrhythmhealth.com/Products/), they list their 4 products. For the probiotic (and the rest of their products for that matter), it says you can buy it on Amazon for $25.99. There’s literally nowhere on their website that directs you to their Amazon page. So that’s odd to me! But on Amazon, the one-time purchase is currently $16.99. And $16.99 is what I paid for it, so that’s how I’m calculating the price and value. With that you get 60 capsules, which is a 1-month supply. So it works out to $0.56 per day to take these. That’s cheaper than average and I feel like the lower cost equates to the value. It’s just not a quality product, in my opinion. So you’re better off skipping this one and opting for something else. Much to my surprise, I didn’t experience any side effects with this probiotic. I’m surprised because if this product really contains what it states, it’s very potent! It even suggests taking up to 4 capsules daily, which would give you a ridiculously high amount of CFU (100 billion to be exact). It continues saying to avoid the reaction, it’s recommended to start with less dosage and slowly increase. So I definitely agree with their suggestions. If you’re new to probiotics, definitely start off with just 1 capsule (1/2 the normal serving) and see how you do with that for the first few days. Even though I religiously take probiotics, I still see some of those effects with potent products. So it was weird that I didn’t experience it with this supplement. As mentioned earlier, the NewRhythm website is super bleak and just a bit strange. It has links for “Shipping & Returns”, “Return Policy”, “About Us”, “Contact Us”, etc. but every time I try to click a link it just stays on the same page and doesn’t redirect you. So it looks like the majority of the links are broken. On the homepage and on the actual bottle, it does say they have a 60-day, 100% money back guarantee. It says that if you aren’t completely satisfied that you can return it and get all your money back, even if the bottle is empty. But there are no other specifics about it. So I assume you just email their customer service email, which is: support@NewRhythmHealth.com. I really appreciate the satisfaction guarantee but it would be nice to have more information about it. To buy NewRhythm Probiotics 50 Billion CFU, click here.